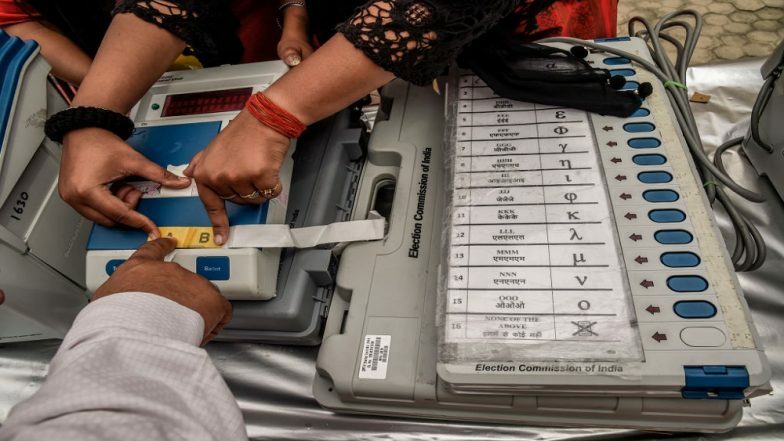 Chennai, April 17: All is set in Tamil Nadu for the crucial 2019 general elections with about 5.8 crore voters to decide on the fate of 822 candidates contesting in 38 Lok Sabha constituencies. On Tuesday, the Election Commission rescinded the poll for Vellore Lok Sabha constituency after the Income Tax (IT) department seized unaccounted cash from the cement warehouse of a DMK functionary. The Election Commission has said the cash was kept for distribution to voters and the situation was not conducive for holding free and fair elections in Vellore. Tamil Nadu Lok Sabha Elections 2019 Dates: Constituency-Wise Complete Schedule Of Voting And Results For General Elections. The Lok Sabha election is not only crucial for the ruling BJP at the centre but also for the AIADMK government in Tamil Nadu. Along with the polls for Lok Sabha in Tamil Nadu, there will be a sort mini Assembly elections with the conduct of by-elections for 22 Assembly constituencies in two phases. The Election Commission will hold by-elections for 18-Assembly constituencies on Thursday while the remaining four seats will go to polls on May 19. A total of 269 candidates are in the fray for the by-elections. The results of both-Parliamentary and by-elections for 22 Assembly seats will be declared on May 23, deciding the fate of the Bharatiya Janata Party-led Central government and also that of the Tamil Nadu government. In the 234-member Tamil Nadu Assembly, the ruling AIADMK has 114 members (including the Speaker), the DMK 88, the Congress 8, and the IUML and Independents one each. To attain a simple majority, the AIADMK has to win just four seats in the by-elections. Factoring in the switching of camps by some of the lawmakers, the AIADMK has to win seven or eight seats in order to be safe. Lok Sabha Elections 2019 Candidates, Campaigns & Rallies on April 17, Live News Updates: Punjab Minister Navjot Singh Sidhu Attacks PM Narendra Modi in Ahmedabad. On the other hand, the DMK has to win all the 22 seats to take the tally, along with its allies - the Congress and the IUML - to 119, just one number more than the simple majority. DMK President M.K. Stalin in his campaign said there will be a change of government in Tamil Nadu once there is a change in the Central government. Analysts are of the view that even if T.T.V. Dhinakaran's AMMK wins a couple of seats, the DMK's dream of coming to power by toppling the AIADMK government may not come true. On Thursday, polling will begin at 7 a.m. on Thursday and would come to an end at 6 p.m. However, in Madurai, the polling will close at 8 p.m. owing to the Chithirai festival. As regards security, 160 companies of para-military forces will be deployed across Tamil Nadu apart from about 1.4 lakh security personnel from the departments of police, prison, forest, home guard and others. In a first time, Voter Verified Paper Audit Trail (VVPAT) will be deployed in all the polling booths, along with the electronic voting machine. With the cancellation of election for Vellore, both AIADMK and DMK are contesting in 19 seats in Tamil Nadu leaving the remaining to the alliance partners. The AMMK and the Makkal Needhi Maiam (MNM), floated by Kamal Haasan, are fighting it alone. While the AMMK candidates are contesting under the common symbol 'gift box', they are classified as Independent candidates as per the Supreme Court order. For the first time in several decades, both the AIADMK and the DMK will be fighting the polls without their iconic leaders- J.Jayalalithaa and M.Karunanidhi who are no more. In 2014, the AIADMK swept 37 out of the 39 Lok Sabha seats getting 44 per cent vote share. The remaining two seats were won by the BJP in Kanniyakumari and PMK in Dharmapuri. The DMK on its own got 23.6 per cent vote share in 2014 Lok Sabha polls. Tamil Nadu Lok Sabha Elections 2019: 7,780 Polling Booths ‘Sensitive’.